Reinhart Johann Christian (24 January 1761 - 9 June 1847) was a German painter and printmaker. 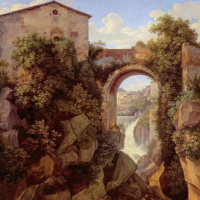 He was one of the founders, along with Joseph Anton Koch, of German romantic classical landscape. Son of deacon Peter Johann Reinhart, Johann Christian born 24 Jan 1761. and His father, descended from an ancient family of craftsmen, died quite early in 1764, so that Johann Christian Amandus and his brother were raised by mother. He died on 9 June 1847 in Rome and was buried in the Protestant cemetery.